Those of us that care about British forces and British ground forces in particular have been alarmed at some of the cuts that have been bandied about. It's obvious that the Royal Marines are about to take a hit and the British Army is about to get kicked hard. So what is the future...what is the British Army's only hope to remain relevant? First check this out. via UK Landpower. At its heart, medium weight doctrine reflects a fundamental shift in doctrinal thinking. First and foremost, it is about having a rapidly deployable expeditionary capability that allows infantry mass to be deployed independently at distance. It recognises that, in future conflicts, getting to the fight is likely to be as challenging as the fight itself. The second key aspect of medium weight forces is that they are a key enabler of divisional manoeuvre. This means that they provide an Intelligence, Surveillance and Reconnaissance (ISR) component; an independent strike or raiding capability; a screening force operating ahead or protecting the flanks of a division; and enabling heavier units to move unimpeded out of contact. Using medium weight forces effectively is about information manoeuvre. This is moving pre-emptively, somewhat like moving a chess piece defensively, to counter a corresponding enemy threat or movement. Medium weight forces can rapidly to encircle, seize and hold territory. They also allow infantry to dominate ground through aggressive patrolling, mobile ambushes and rapid reinforcement. The most significant shift in thinking is that medium weight vehicles are not intended to take-on main battle tanks. Ideally, these will be defeated by combat aircraft, attack helicopters, long range ATGMs and precision fires. Medium weight formations will avoid or outmanoeuvre a superior enemy force through the speed and agility of their wheeled vehicles. Connectivity also plays a part in this. When medium weight units are networked into other C4ISR assets, this builds a real-time awareness of enemy dispositions. Allocating dedicated UAV support will provide a timely warning of any enemy forces heading towards it, but also the ability to neutralise enemy armour. Ok. Right off the bat let me tell you this. Check out this blog! You can get to it here. This dude hit every buzzword floating around the Pentagon. But if you take the time to read the entire piece, you'll see that he sells the concept pretty well. So well that I think we can even jump ahead and say that this is the Brit Army's only hope. As much as we might hate it the Brits just can't afford tanks anymore. I believe those that say that tanks are dead...are dead wrong! But that conventional thinking seems to be all the rage. That is what the author believes will protect the Medium Weight Wheeled Force. That's HQMC thinking. I believe he's wrong and I can just look at developments in Russia and China and come to one conclusion. They aren't seeking air superiority. They're seeking to DENY US air superiority! I believe the future battlefield (with nation states involved) will be so deadly for aircraft that they will not even try and wander over it. I think we'll see the same situation we see in Ukraine. Airpower will be rendered inert....too valuable to risk over a too dangerous battlefield. Artillery will be king. This one will be tricky for the Army. They've bought a range of vehicles with no rhyme or reason behind it. It's all been under Urgent Operational Requirements so they've gotten it with little debate. Now? Now they have a roadmap laid but will have difficulty getting this dog's breakfast of a procurement system to get the proposal past the House of Commons. I see a plan for the British Army. They could still be effective in low intensity warfare and have a place in a high intensity fight. The problem is now money. 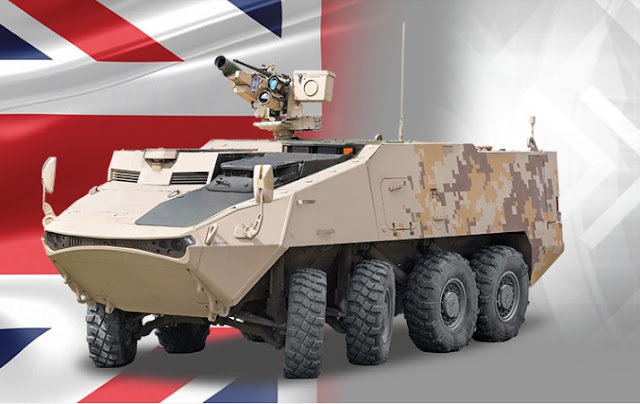 Will they be able to get policymakers to dig into pockets to buy another magic vehicle now that they have the Ajax Scout going? Will they admit to failure in previous plans and move out on this one? This generation of leaders just can't admit when they've done it wrong. They'll continue to muddle thru, and will continue buying vehicles that won't fit with the one concept that they could possible afford that would still leave them a place at the table when it comes to land warfare. And that my friends is just too bad.